The photovoltaic capabilities at the FSEC Energy Research Center range from small-scale thin film photovoltaic (PV) cell manufacturing to large-scale commercial PV systems testing. Photovoltaic capabilities also include module durability, and on-site testing and field evaluation of solar lighting systems. Intructor-led, hands-on training, and photovoltaic technical support are also areas of expertise. Researchers and graduate students in the Photovoltaic Materials Laboratory conduct a wide range of research for the development of renewable energy. Research projects include: PV module aging and durability testings, the development of thin film solar cells for terrestrial and space applications, and the development of photoelectrochemical (PEC) cells for hydrogen production. This lab has excellent facilities for the preparation and characterization of large 4”x 6” solar cells, which are viable to serve as a nucleus of a pilot plant for fabrication of CIGSS thin film mini-modules. The indoor solar simulator flash lab compliments the outdoor infrastructure and completes the photovoltaic module testing capability. The centerpiece of the indoor flash lab is the Spire 4600SLP. It offers Class A spectral, spatial, and temporal performance, which exceeds IEC 60904-9 Standards. Researchers are able to conduct world-class diagnostic and baseline PV module testing, using state-of-the-art EL imaging, IR photography, and multiple Sinton I-V flash devices. Hot, humid climate provides operational challenges for equipment manufacturers. Fortunately, the FSEC Energy Research Center provides highly-reliable results for photovoltaic array and inverter testing. Researchers collect and analyze data to characterize the performance of inverters and PV systems in different configurations. They gain useful insight in key performance concerns, including array and inverter efficiencies and system reliability. The inverter test facility includes a configurable 12-kW PV array and four parallel test beds. Each test bed monitors the following parameters: DC voltage, DC current, AC Voltage, AC Power and inverter temperature. A separate, synchronized data logger records solar irradiance, ambient temperature, and several PV array temperatures. Inverter testing includes data collection in near real-time for DC input currents and voltages, and AC output parameters. Multiple internal and external inverter temperature location points are measured. Cumulative energy harvests and instantaneous power measurements are also recorded. 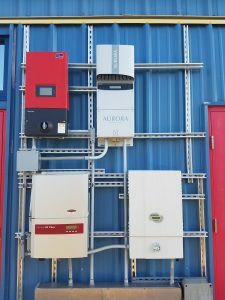 Capability exists to test grid-tied string inverters, micro-inverters, grid-tied battery backup, and off-grid battery backup technologies. Data collection includes near real-time meteorological data—alongside the photovoltaic array and inverter data sets. Measurements include direct and diffuse solar irradiance, ambient temperature, rainfall amount, relative humidity, and wind speed. Located approximately three miles from the main office building in Cocoa, FL. The auxiliary site test facility, is capable of testing large-scale commercial photovoltaic systems. More than 100kW of installed sub-systems are constantly monitored and analyzed. The currently installed infrastructure can accommodate upwards of 200kW of photovoltaic systems. Photovoltaic capabilities at FSEC Energy Research Center continue to grow. As seasoned experts in solar research, our team can help meet your research or testing needs. Have a photovoltaic research or testing need? Contact info@fsec.ucf.edu.